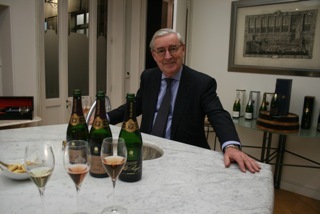 Pol Roger President, Patrice Noyelle, was in ebullient mood when I met him earlier in the year and tasted the new Pol Roger 2002 vintage, which he sees as marking a new direction for Pol in terms style, with increased subtlety and finesse. He was buoyed up by the excellent year the company had in 2011, much of which he puts down to being the provider of Champagne to the royal wedding. It was at his insistence that the order was changed from bottles to magnums. The 2002 vintage has a lower dosage than ever before at 8gms/l – they made a blend with just 6gms/l that was seriously considered as an option for release – and the wine is certainly a contrast to the rich, fairly forward style of the 2000 vintage that preceded it. Gentle, and beautifully balanced, as the best 2002s mostly seem to be, it takes time to evolve in the glass and clearly has a long future ahead of it for those “with the patience to wait”, as Noyelle puts it. The UK allocation was sold within a few days, according to UK MD Nick James who is hoping he may get more stock. Magnums are particularly sought after.